Turning 21, or hosting a corporate event or bachelorette party in Baltimore? Fells Point, a historic maritime village located along the Baltimore harbor, is the perfect place for 2019 Baltimore group events! From 5-star hotels to bars with nightly live music, Fells Point has it all, in a charming neighborhood setting. If you are planning a party or group activity in Baltimore’s Fells Point, look no further than this guide for event, hotel, and restaurant ideas. Sagamore Pendry: Located in the center of Fells Point. You can’t get any closer to the action in Fells Point than the newly opened, spectacular Sagamore Pendry Hotel. Hyatt Place Baltimore/Inner Harbor– 10 minute walk, 0.5 mile from Fells Point center. Baltimore Water Taxi: The easiest way to navigate the Baltimore harbor area. All water taxi routes stop in Fells Point at stop 11. Please note that water taxi service ends at 8:00pm. More info on the Fells Point Water Taxi stop. There are group discounts available for groups of 20 or more. Shuttle Services: List of Baltimore area shuttle services recommended by the Baltimore Convention and Visitors Center for 2018 Baltimore group events. Whether you need a small van or a large charter bus: https://baltimore.org/shuttle-service Also, many area hotels offer complimentary guest shuttle services to Baltimore’s various attractions. Charm City Circulator Bus: Green Route stop 121 near the North pavilion of the Broadway Market is the closest stop to the center of Fells Point. The stop is at Broadway and Fleet St. Continue South to reach the Fells Point square. More information on the Green Route. Original Fells Point Haunted Pub Walk. Step through the doors of some of Fell’s Point’s most haunted pubs for a fascinating haunted pub crawl tour of this historic maritime neighborhood. Ages 21 and over only, lasts approximately 2 hours and visits 3-4 pubs during that time. During this event, guests can choose to buy a drink at each stop. Pricing: $20/pp for groups of 15 or more, or a flat fee of $300 if less than 15 people. There is no maximum- we break large groups up into groups of 20, each with their own tour guide. More group tour information is here. 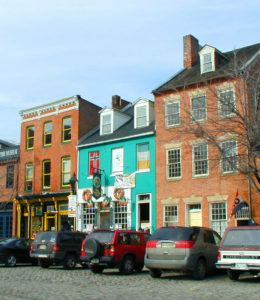 Fells Point Wicked History Pub Tour: Join Baltimore Wicked History Tours as we take you on back to when Fells Point was a colorful, dangerous place to visit, crawling with sailors, privateers, ladies of the night, and immigrants looking for a better life. 2 hour Fells Point Wicked History Pub Tour: $20/pp, groups of 15-20 or a 300 flat fee if less than 15 people. 21 and over only. More group tour information is here. Original Fells Point Ghost Walk. This tour is similar to the Original Fells Point Haunted Pub Walk, but there are more stops and it does not go inside pubs. This is an all ages tour and lasts 1-1.5 hours, depending on the tour guide. More group activity information is here. Urban Pirates: Urban Pirates’ boats can hold up to 49 people and are available for private charter. You can bring your own grog on these cruises! Group discounts are also available for groups of 25 or more. More group event information is here. Mustang Alley’s: Mustang Alley’s is an upscale bowling alley with 12 lanes, a chef inspired menu, and a full service bar. It is within walking distance to Fells Point. Event space available for parties of 24-250 people. More group event information is here. Douglass-Myers Maritime Park: This museum is a national heritage site that honors the role of African Americans in Baltimore’s maritime history. The venue has spectacular views and has space available to rent for an upscale group event. More group event information is here. Bertha’s: Bertha’s is world famous for their mussels. They also have private dining rooms and menus available for groups. This is the first stop on the Fells Point Haunted Pub Tour! Group dining information is here. The Horse You Came in On: The Horse is the oldest bar in continuous operation as a bar in Baltimore city. They also have a private room that is available to rent to groups. Contact them for more information by calling 410-327-8111 or filling out their online form here. Max’s Taphouse: Max’s is one of the best beer bars in the world. Boasting a stock of over 1,000 bottles, 102 taps, and 5 casks. They have an upstairs bar that is available for groups. Contact information is here. Bond Street Social: Private rooms/menus available for up to 120 people. Group catering and drinks menu. Complete group information is here. Waterfront Hotel: Casual and lively bar with live music. Private parties and catering available: http://www.waterfronthotel.us/. Red Star Bar and Grill: Tucked away on Wolfe Street, the Red Star has an open and warm feel. Private parties for up to 200 people. Join Baltimore Ghost Tours this February for our 2019 Valentine’s Day event- the Haunted Hearts Pub Tour! Explore the amazing, astounding and horrifying history of Valentine’s Day, and some of Fells Point’s most interesting taverns with storyteller and historian Cliff Long. 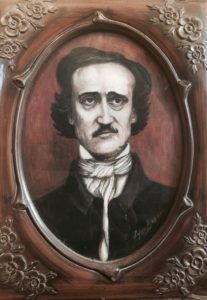 From the tale of the first valentine to the story of Edgar Allan Poe’s failed Baltimore romance, this tour is sure to leave you breathless! 21 and over only! Please note that this tour is not primarily a haunted tour. 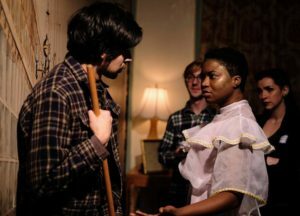 It focuses on the macabre history of Valentine’s Day. Price: $22/pp, 21 and over only. This tour is also available as a group activity or corporate event. Please email us at info@baltimoreghosttours.com or fill out our group tour reservation request form. Along with the bars and restaurants, Fell’s Point has great shopping. Come a couple of hours early before your ghost tour or haunted pub crawl to stock up on some items that you won’t find anywhere else. Here are some of our favorite places to treat yourself or find a unique gift. Shopping in Fells Point: Thames St.
Max’s Taphose: T-shirts There are many reasons to visit Max’s – their beer selection, Belgian beer weekends, but we also like them for their clever t-shirts. “In Dog Beers, I’ve Only Had One.” Classic. Poppy & Stella: Boots. When you’re looking for the perfect knee high boots for your fall uniform of sweater, jeans, tall boots, no need to go further than the well curated selection at Poppy & Stella. Ten Thousand Villages: Jewelry. Keep walking towards the water to pick up some jewelry for your fall uniform at Ten Thousand Villages. They have a sparkly assortment in the back corner. Modern Cook Shop: Gourmet Fare. Be the best guest and bring a delectable gourmet treat from Modern Cook Shop. Fell’s Point Surf Co.: Sunglasses. Just because it’s fall doesn’t mean you don’t need cute sunglasses. Find them at Fell’s Point Surf Co. in a range of prices. aMuse: Games. Check out Klask, an air hockey type game from the pubs in Denmark that has been shrunk for your tabletop, at aMuse along with the creative baby and kid gifts. Sound Garden: Socks. Come for the music, but stay for the socks! Sound Garden is known for its vinyl, CDs, DVDs and video games. They also have a wall of cute socks. Su Casa: Kitchen Goods. Duck across the street for the cute tea strainers and kitchen items at Su Casa. The Seasoned Olive: Olive Oil and Vinegar . Don’t miss the olive oil and balsamic vinegars at the well-named The Seasoned Olive. Natty Boh Gear: Koozies. Giving cash for a wedding is expedient, but impersonal. Pick up some Boh and Utz wedding koozies at Natty Boh Gear. One of the questions that we get asked the most often by guests on our tours is “What are the best Fells Point restaurants and bars? 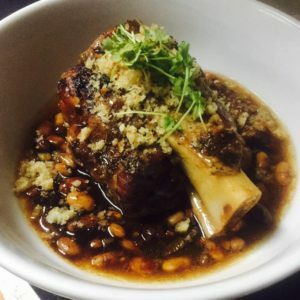 Where should we go to eat?” Fells Point has a slew of great bars and restaurants, but these are some of our personal favorites, and picks for what to choose. Thames Street Oyster House. It’s always busy for a reason. Thames Street Oyster House has great fare, including our favorite, the lobster roll. You will need a reservation on weekend nights. Peters Inn. We dream of Peter’s Inn green salad and garlic bread. Ekiben. Limited menu, but everything on it is solid. The spicy neighborhood bird on a steamed bun is worth the trip. Bertha’s. We’ll take a hot buttered rum drink from Bertha’s, thank you very much. They also have cask conditioned beer. Tortilleria Sinaloa. Tortilleria Sinaloa’s warm stack of tortillas awaits on Eastern Avenue. Cheap, delicious and ready for carry out. Duda’s Tavern. Their crab cake is a neighborhood mainstay. Nanami Cafe. Nanami Café always has the tastiest sushi. Drop in during the week at lunchtime for their combination box. The Horse You Came In On. Join the Jack Daniels club at The Horse You Came in On. One Eyed Mike’s. Or the Grand Marnier Club at One Eyed Mike’s. Don’t miss their homemade chips. Blue Moon Cafe. For the gooiest cinnamon bun in town, order the larger than your head, sugar loaded masterpiece at The Blue Moon. Our favorite time of year – Fall! We will be adding Fells Point Haunted Pub Crawls every night in October, and we are gearing up for the Fall 2018 ghost tour season. Haunted tours make great Fall group activities or corporate events for any Baltimore area company. Our tours are available year round as well. Book Now or email us at info@baltimoreghosttours.com to book your corporate event or group activity! Our walking ghost tours are all ages tours- perfect for corporate events including children, or anyone who does not want to visit pubs. 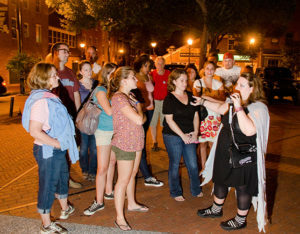 The Original Fells Point Ghost Walk and the Mt Vernon Ghost Walk each last approximately 1-1.5 hours. Our Fells Point Haunted Pub Crawl Tour and Mt Vernon Haunted Pub Crawl are for ages 21 and over. Two hour pub crawls visit some of Baltimore’s most colorful and lively taverns- which also happen to be haunted! All ages walking tours: $10/pp for groups of 20 or more. If you have less than 20 people, there is a flat fee of $200 to book a tour. 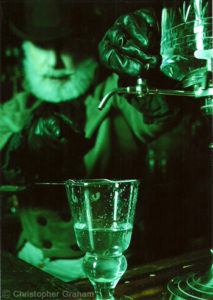 Haunted Pub Tours are $20/pp for groups of 15 or more. Groups of less than 15 people are charged a flat fee of $300. For more information about planning a group activity or corporate event in Baltimore, our convention and visitor center staff at Visit Baltimore are happy to help groups with hotel reservations, transportation and dining recommendations. Please see their web site for more information! 2017 Holiday Haunted Pub Tour dates announced! 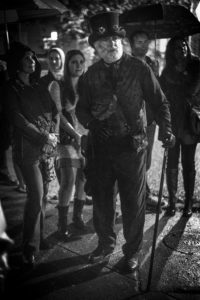 September 19, 2017 / baltimoreghosttours / Comments Off on 2017 Holiday Haunted Pub Tour dates announced! All tour times are at 7pm. Order tickets here! We are thrilled to announce that we are running the Original Fells Point Haunted Pub Crawl every night in October through October 30th! This is a great group activity, and the pubs aren’t as crowded on week nights as they are on the weekends. Grab a group of friends or co-workers and come out! New: The Tales of Piracy Pub Tour: April 1, 2017! February 15, 2017 / baltimoreghosttours / Comments Off on New: The Tales of Piracy Pub Tour: April 1, 2017! Join Captain Flint (tour guide Cliff Long) during Privateer Days in Fells Point for a rollicking raid on four taverns as we plumb the depths of numerous pints and explore a treasure chest full of stories and tales both true and legendary focusing on that immortal group of scaliwags, scoundrels, and freebooters known as The Bretheren of the Coast! Pirates! Discover the origin of the first Jolly Roger, learn of the exploits of Henry Every, known as “the pirate who got away,” be amazed at the grit and backbone shown by Anne Bonny and Mary Read, two of the most famous female pirates of all time, and shed a tear at the true story of Black Sam Bellamy and the wreck of the Whydah, his lost love, her doomed crew, a ghostly vision, and the recovery of her treasure in the 20th century; a treasure worth millions. Need more? Not to worry; we’ll be “yarnin’ through the spars” all evenin.’ Have a hankerin’ to sign on? Do it now! Guaranteed, this tour ain’t no common “bilge and blather”! There’s limited berths on this voyage, and the early bird gets the worm, so see you on April 1st, and don’t forget t’ don yer pirate gear! Aargh!! Please note that this is not a haunted tour. It is a history tour. Price: $20/pp, 21 and over only. 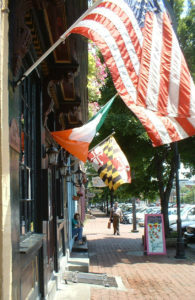 Fells Point Wicked History Pub Tours are running all Winter! December 26, 2016 / baltimoreghosttours / Comments Off on Fells Point Wicked History Pub Tours are running all Winter! Join our sister company, Baltimore Wicked History Tours, as we take you on back to when Fells Point was a colorful, dangerous place to visit, crawling with sailors, privateers, ladies of the night, and immigrants looking for a better life. Tempers ran hot with people who had nothing to lose and those looking to exploit them. But Fells Point had its bright spots with luminaries like Billie Holiday and Edgar Allan Poe roaming these historic streets. Come take our Fells Point history pub tour and crawl and experience Baltimore’s scandalous history! This is a Baltimore history tour like no other. Some might call it wicked.